Since January 2015, the production of primary aluminum in the United States has fallen by more than 50%. The United States consistently produced about 140,000 metric tons of aluminum each month until mid-2015, when output slowed significantly. Since April 2016, primary aluminum production has averaged around 60,000 metric tons per month, even as aluminum prices have slowly increased. Primary production of aluminum is more price-sensitive than secondary production of aluminum (i.e., recycling). 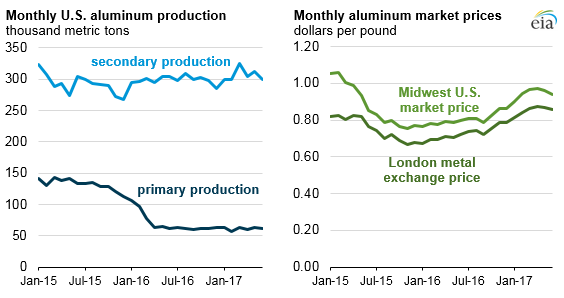 In the U.S. Geological Survey’s monthly mineral industry survey for aluminum, the Midwest price is the typical benchmark for U.S. trade, and the London price is the typical benchmark for international trade. Although the recent downturn in U.S. primary production of aluminum was initially attributed to declining aluminum prices, the price of aluminum has nearly returned to early 2015 levels, while primary aluminum smelting levels remain relatively low. Several other factors have contributed to the recent decline in domestic primary aluminum production, including higher labor costs and the strength of the U.S. dollar. Primary aluminum production is extremely energy-intensive and uses electricity throughout the smelting operation. Plants have curtailed production rather than closing entirely. The downturn in domestic primary aluminum production is unlikely to reverse in the near future. Production curtailments allow producers to temporarily reduce operating costs while hoping for market conditions to improve. The high number of domestic plant curtailments in the previous five years likely indicates that aluminum production firms do not believe the market is going to return to profitable conditions soon. According to the U.S. Department of Energy’s Advanced Manufacturing Office, aluminum is the most energy-intensive major product produced in the United States, requiring about 45,000 British thermal units per pound of production (Btu/lb). Production of paper and paperboard products (the second most energy-intensive industry) uses about 16,000 Btu/lb. Electricity prices for industrial customers are higher in the United States than in other large primary aluminum producers, such as Russia and Canada, where relatively inexpensive hydroelectric power offers low electricity prices. The primary aluminum production process is also labor intensive, putting domestic firms at a disadvantage when competing with producers in China and Middle Eastern countries where wages are lower. In addition, a strong U.S. dollar makes domestically produced aluminum unattractive to foreign buyers and also makes intermediate inputs from foreign suppliers more attractive. According to the U.S. Geological Survey, most U.S. aluminum imports come from Canada, Russia, and the United Arab Emirates. U.S. aluminum exports have remained relatively constant since 2015, while aluminum imports have increased. Aluminum imports include unfinished metals and alloys, as well as finished plates, sheets, and bars, but they do not include imported scrap for secondary production. 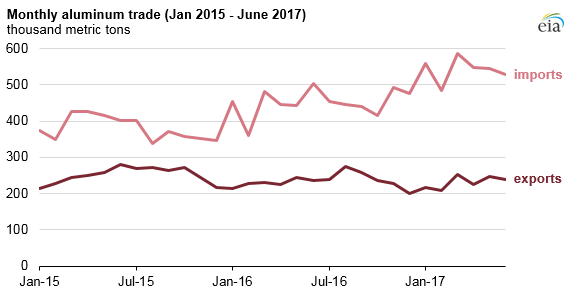 Total U.S. aluminum supply, including primary production, secondary recovery, and imports, has remained at or above early 2015 levels. Secondary production has remained relatively flat, and an increase in imports has made up for the loss of primary production. Aluminum does not degrade as it is recycled and reprocessed. Secondary aluminum can be used for most applications that require aluminum. According to a study by the Advanced Manufacturing Office, secondary aluminum production consumes only 6% of the energy associated with primary aluminum production, finding that recycling aluminum essentially recaptures all the energy associated with mining, refining, and smelting involved in primary production.